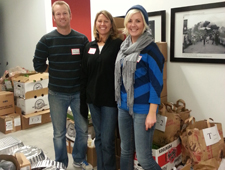 For the second year in a row Tinnelly Law Group participated in the Families Forward Thanksgivng Basket Distribution. Last Friday, Sommer, Kai and Terri joined fellow volunteers on the “school pickup” team and loaded cars full of all the trimmings necessary for a wonderful Thanksgiving meal. The distributions on Friday and Saturday were expected to feed over 700 Orange County families, and the entire TLG team feels blessed for the opportunity to be a part of such a great cause!